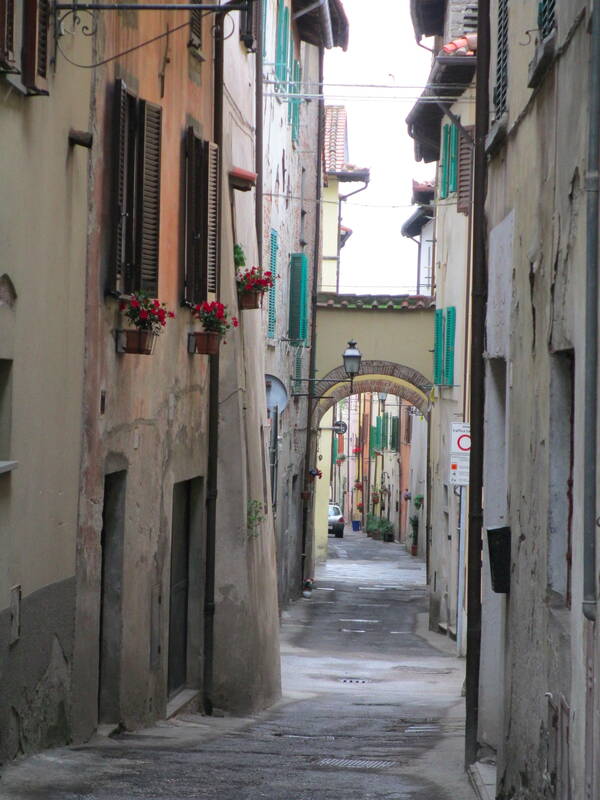 Tuscany like much of Italy is dotted with small, old towns. Some date back to the times of the ancient Romans. 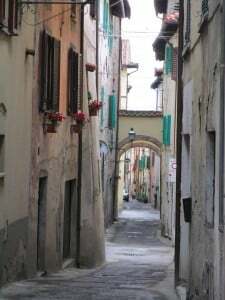 In many you will find the Centro Storico, enclosed by stonewalls. Entering the portal of these areas will take you back in time. Museums hold artifacts and famous artwork. Little shops with local crafts can be found tucked into the stone everywhere. We found one such special piece in a shop under the road! 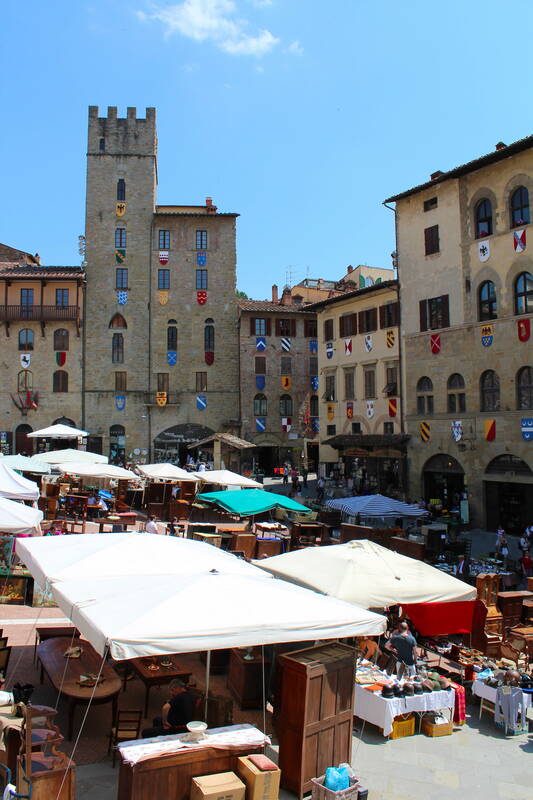 I wanted to visit Arezzo first, because it was the location for the Academy Award winning film “Life is Beautiful.” On the day of our visit, the town was having its monthly antique market. My son-in-law noticed a church across from the café where we were having lunch and was amazed by the frescos on display. As we ended the day, he once more encouraged me to come inside and take a look. Not being a student of art, it was several days before I realized that we had been viewing the famous Renaissance artist, Piero della Francesca’s the “Legend of the True Cross.” Under ordinary circumstances, we should have paid an admission fee and been part of a group of twenty-five. Obviously I am glad that I opened that door. 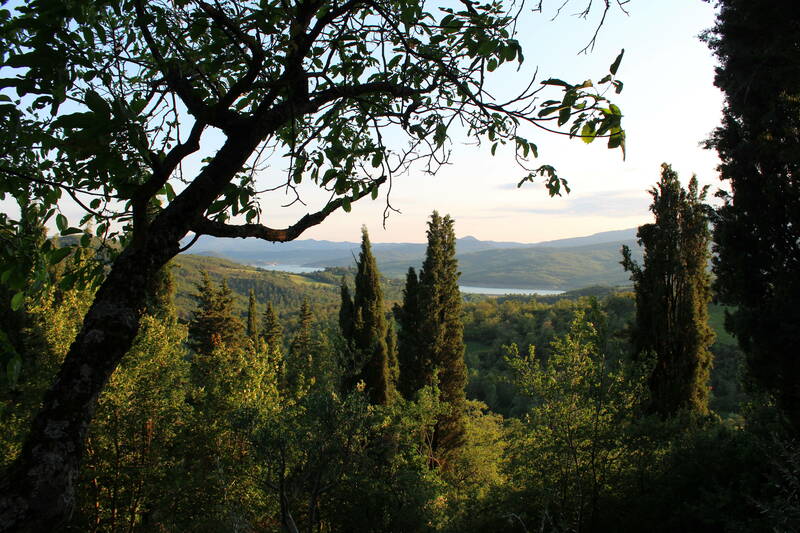 We are staying near Sansepolcro, the birthplace of Piero della Francesca. The Museo Civico houses an additional set of his frescos, most notable, his Resurrection. Peiro’s Madonna del parto can be found in Monterchi a twenty-minute drive away. Viewing these paintings up close is well worth the effort. Piero is recognized for his ability to use light in his work to create form and perspective. 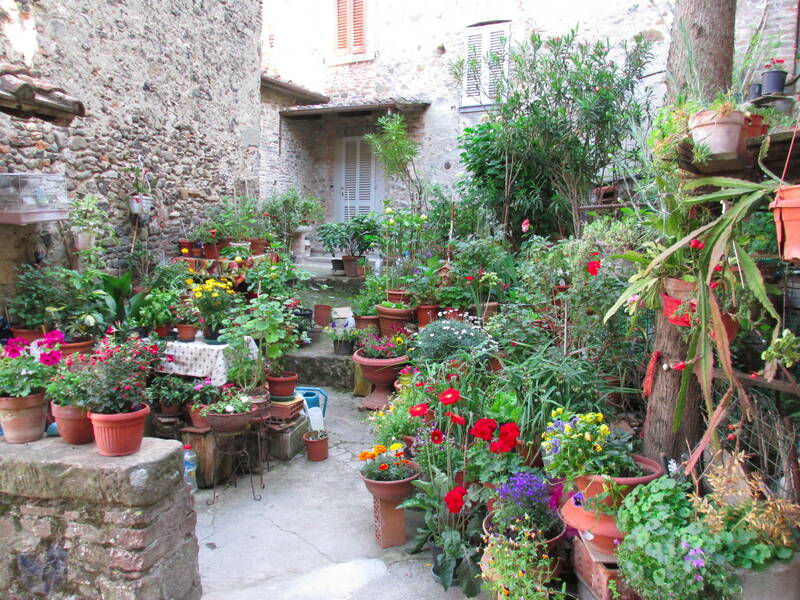 Above Sansepolcro, is the mountain town of Anghiari. 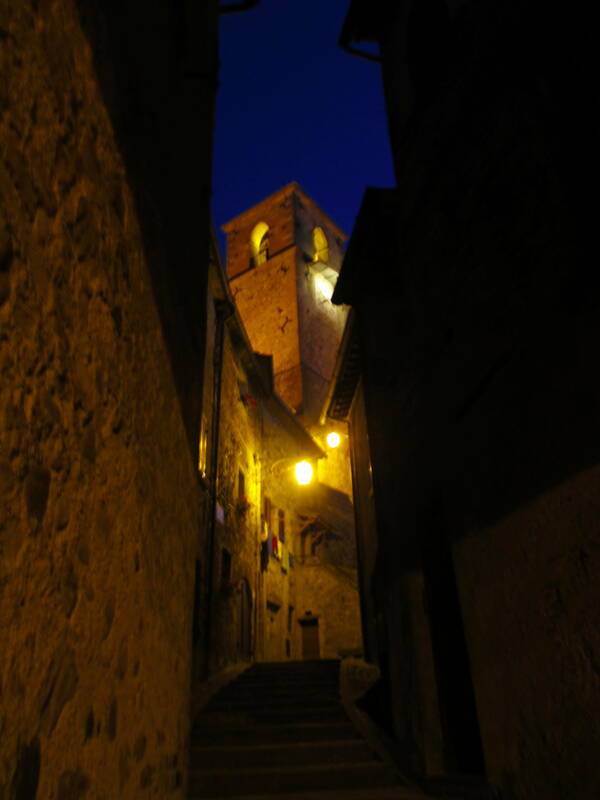 It is a small town but not as touristy as Cortona or Sienna. We found it quite beautiful and learned the history of the region, which includes a famous battle between the soldiers of Florence, backed by the Pope and the Duke of Milan’s more experienced troops. Several artists throughout history have recorded the outcome but the first sketches of the battle belonged to Leonardo da Vinci. He used a new technique for frescos adding wax to the paint but the results were a failure and Leonardo never finished the work. The surprising thing is that those painters who did complete the work used some of the same compositions as Leonardo’s sketches even though there was no way for the artists to have seen them! Cortona has been made famous through the book and movie of the same name, “Under the Tuscan Sun.” I was amazed that it took my husband all of five minutes to locate Mayes’ house, Bramisole on Google Maps, which led us easily to the property for photo opportunities. 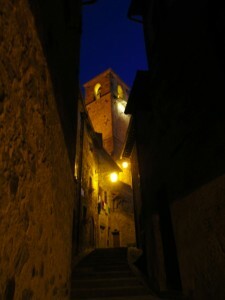 We also went to another (for me) movie inspired town, Lucignano. The film, “Certified Copy” used Lucignano for its setting. Unfortunately I could not get a feel for the movie even though there are posters for it in the visitor’s center. A local realtor explained that the sites used have been changed since the filming and some of it was shot in Cortona. 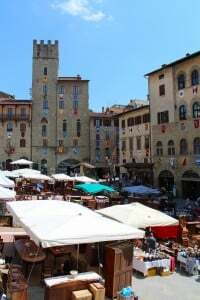 Oh well, it is an elliptical shaped medieval town that was holding an open air market the day we came, so all was not lost. If we had the money where we would be living! Road Trippin’ in Europe, Summer 2018!